On Saturday night a legend in the sport of boxing and one of the greatest, if not greatest, fighter that the city of Philadelphia has ever produced will, allegedly, be fighting his last fight in his illustrious career. 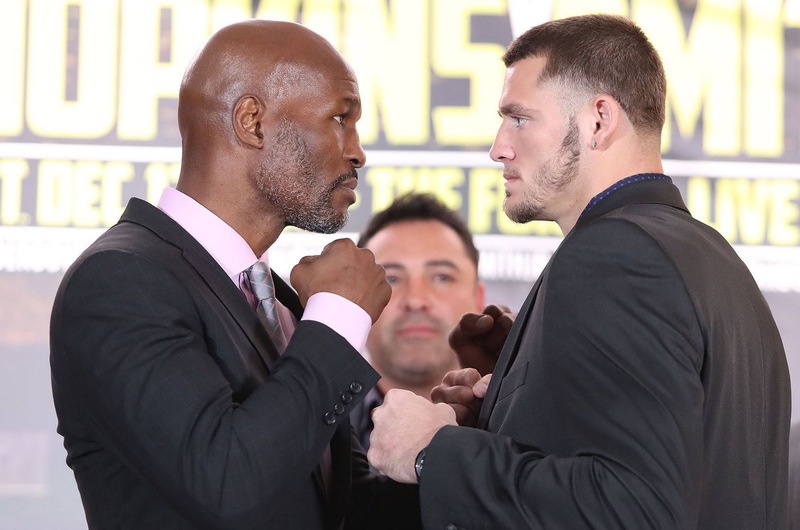 Bernard Hopkins will step into the ring to face Long Island, New York native Joe Smith in a light heavyweight showdown in the main event of HBO World Championship Boxing. This bout will take place at the Forum in Inglewood, California. HBO and Golden Boy Promotions will be televising three bouts on Saturday night. The opening bout of the night will be a WBO Cruiserweight Title bout between upstart champion Oleksandr Usyk and Thabio Mchunu. The co-main event of the night will be between Joseph Diaz and Horacio Garcia in the featherweight division. Oleksandr Usyk is one of the best prospects to come out of the Ukraine and is a former Olympic Gold Medalist in the 2012 Summer Olympics and was a Gold Medalist in the 2011 World Championships. He won these medals while competing as a heavyweight and was able to capture the WBO Cruiserweight World title before his 11th professional fight. His opponent, Thabiso Mchunu, does not have the amateur pedigree of Usyk but held several regional titles as a professional. Usyk holds the edge in height, reach, and power. He is four inches taller than Mchunu, he will have a five and a half inch reach advantage, and has stopped all of his opponents except for one. Mchunu only has 11 stoppage victories and eight of his opponents were able to go the distance. Both boxers are southpaws but Usyk is a better technical boxer than Mchunu and should be able to handle it well. Usyk has defeated the likes of Krzysztof Glowacki in Poland, Pedro Rodriguez, and Andrey Knyazev. He has fought three times in 2015 and once in 2016. Mchunu has beaten the likes of Boniface Kabore, Garrett Wilson, and Eddie Chambers. His losses were to Illunga Makabu and Zack Mwekassa. He fought once in 2015 and once in 2016. Usyk is a boxer to keep a close eye on as he has a high ceiling and has fights televised on HBO early on in his career. Mchunu should be a good test for him, but it’s a test that Usyk is expected to pass with flying colors. Joseph “Jo Jo” Diaz is one of Golden Boy Promotions’ best prospects and is expected by many to be a future star in the sport of boxing. Diaz is two years younger than Garcia and will be giving up one inch in reach. They both stand at 5’6” tall. Diaz has the better amateur background and competed in the 2012 Summer Olympics for the United States. He has been very active and fought five times in 2015 and three times in 2016. Garcia has not been as active and fought once in 2016 and three times in 2015. Diaz, a southpaw, has thirteen stoppage victories and three of his past four fights ended in a stoppage victory. Garcia has twenty two stoppage victories and has gone 4-1-1 in his last six fights. Diaz has slowly been facing stiffer competition and has beaten the likes of Jayson Velez, Ruben Tamayo, and Rene Alvarado. He does have a loss in the World Series of Boxing to Braulio Avila by points, but that’s considered to be a part of his amateur record. Garcia hasn’t beaten many opponents that are well known outside of Mexico. He has beaten the likes of Jonathan Perez and Raul Hidalgo, but he also has losses to Hozumi Hasegawa in Japan and Erik Ruiz in his last bout. Garcia has gone 2-1-1 in professional fights that take place outside of Mexico and it seems a near certainty that his record outside of Mexico will worsen to 2-2-1 on Saturday. Bernard Hopkins first professional fight took place in 1988, one year before his opponent Joe Smith was born. Hopkins has claimed that Saturday will be his last professional fight, but many wonder if he will uphold that promise if he wins in convincing fashion. Hopkins turned pro after being released from prison in 1988 and lost his debut fight to Clinton Mitchell. But his career after that loss has been stellar and clearly hall of fame worthy. Hopkins is 51 years old and will be 24 years older than Joe Smith when they step into the ring. However, Hopkins will have a one inch height advantage and a two inch reach advantage. Currently, Smith probably has the edge in power. He has stopped eighteen of his opponents while Hopkins has stopped thirty two. However, Hopkins’ last stoppage victory came in 2004 against Oscar De La Hoya. Hopkins has fought nearly everyone that had a name in the middleweight division and has a very impressive list of boxers that he has defeated. He has beaten the likes of Joe Lipsey, John David Jackson, Glen Johnson, Keith Holmes, Felix Trinidad, William Joppy, Oscar De La Hoya, Antonio Tarver, Winky Wright, Kelly Pavlik, Roy Jones Jr., Jean Pascal, Tavoris Cloud, Karo Murat, and Beibut Shumeno. He has losses to boxers such as Sergey Kovalev, Chad Dawson, Joe Calzaghe, Jermain Taylor, and Roy Jones Jr.
Joe Smith Jr. became well known with his shocking upset TKO over Andrzej Fonfara in his last bout. His only other well known victory came against Will Rosinsky. His lone loss was early on in his career to Eddie Caminero in only his seventh professional fight. The biggest concern about Hopkins is his age and his recent inactivity. Not only is Hopkins fifty one years old and close to mandatory retirement age, he also hasn’t fought since 2014, over two years ago and was forty nine years old at the time. Joe Smith has faced six different opponents since Hopkins last fought and fought three times in 2015 and twice in 2016. They say father time is undefeated, but it appears Hopkins is intent on beating father time. This writer isn’t sure Hopkins will beat father time in the long run, but is fairly confident he can beat Joe Smith, even if he’s over the age of fifty.